I have been working as an Osteopath since 1996. I gained my qualifications at Sutherland College in Antwerp and have had my D.O since 2003. 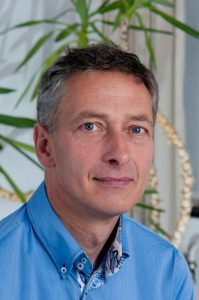 • I worked as an Osteopath from 1996 until 2011 at the Integral Medical Centre in Amsterdam where I was the initiator of the “Child Consultation Hour”. • I have also worked for 5 years at the Paramedic Centre “De Klimboom” in Lelystad. This was a collaboration of child-oriented physiotherapists and orthopaedists. During this period my predominant focus was the treatment of children. • I have taught for 5 years in the Osteopath School of Amsterdam. This is a question that motivates me daily in my professional role as Osteopath. In April 2011, I began a Master course in Child-oriented Osteopathy at the Osteopathie Schule Deutschland and am currently studying part-time at the University of Wales for my MSc. As an Osteopath I have collaborations with other colleagues and professionals including physiotherapists, medical doctors, specialists, dentists, dieticians, yoga teachers and sport instructors.